The population in the area that found itself outside the fence has grown threefold and now numbers about 140,000 people, about a third of the population of east Jerusalem. 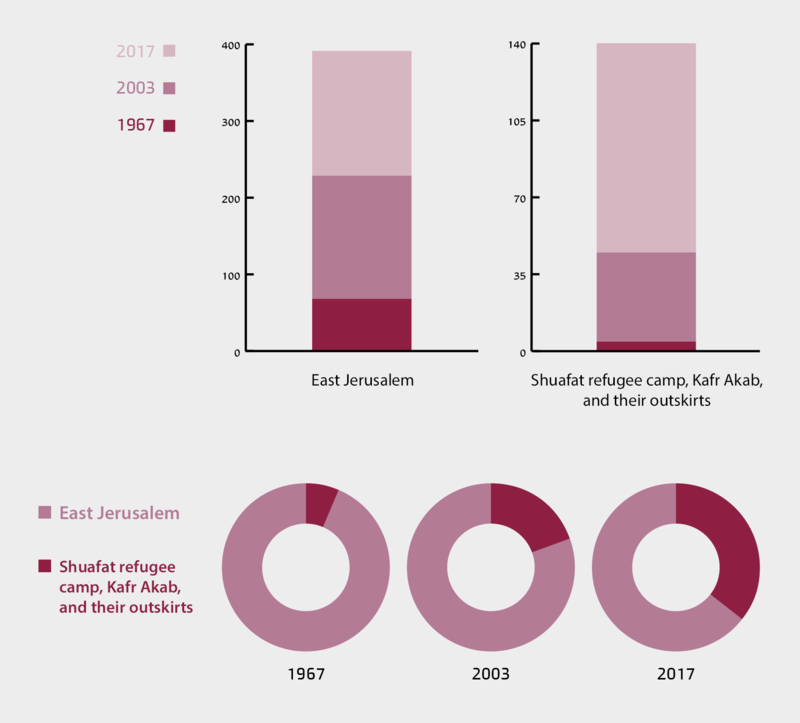 Whereas from the building of the fence to the present, the population in the area that was moved outside the fence has increased by 300 percent, in the rest of east Jerusalem, the increase was only 71 percent in this period. The extraordinary growth of the population in this area resulted from a large and especially cheap supply of housing, the great majority of which was built without authorization. The lawless construction in the area of Kafr Akab-Shuafat is only one aspect of the chaos that the fence created in these neighborhoods. According to estimates, 30-40 percent of the residents of the Kafr Akab-Shuafat area are not east Jerusalem residents and do not have residency status. Since the building of the fence, the area has become a magnet and place of residence for tens of thousands of non-Jerusalemites who come to it from areas in the West Bank. The two populations, residents and nonresidents, are merging: the West Bank residents and the east Jerusalem residents are intermarrying and raising families together. According to Israeli law, the children of these couples are entitled to Jerusalem-resident status. This demographic reality makes it very difficult for Israel to maintain a substantial Jewish majority in its capital, a majority that is shrinking and now stands at only 59 percent. The building of the security fence south of the Kafr Akab-Shuafat area has further exacerbated the neglect, crime, poverty, and ungovernability that already prevailed in it. For many years this area was defined as a “no man’s land.” Among its many manifestations of distress are: drugs, poverty, widespread building infractions, flight, neglect, an especially low level of municipal infrastructures and services, illegal weapons, and generally a severe lack of governance. This state of affairs is unacceptable and can no longer be ignored. After 50 years of neglect, the state has a moral and human obligation to rehabilitate these neighborhoods. They are among the territories and neighborhoods that were added to the state of Israel half a century ago, and to which the law, jurisdiction, and administration of the state were then applied. The action plan proposed here was first formulated about three years ago at the Jerusalem Center for Public Affairs by Nadav Shragai in his book Jerusalem: Delusions of Division. It was eventually adopted by cabinet ministers and members of Knesset, who are promoting it through legislative actions. The Arab neighborhoods in north Jerusalem – the Shuafat refugee camp and its outskirts, along with Kafr Akab-Semiramis and its sub-neighborhoods, all of which remained north of the security fence – will be removed from the municipal boundaries of Jerusalem but will remain within the state of Israel and its sovereignty. Israel will establish two municipal authorities for these neighborhoods. Their residents who hold Israeli residency cards will continue to hold them and to be permanent Israeli residents, with all that it entails. The Interior Ministry will be in charge of implementing the plan. The plan does not require legislative measures in the Knesset because it entails a change of municipal boundaries within a territorial unit that is already within the state of Israel and under Israeli sovereignty. Hence the plan has high political feasibility compared to other plans. According to the existing law, including the amendments to Basic Law: Jerusalem, Capital of Israel that were adopted in the Knesset on January 1, 2018, in order to establish the new councils, the Knesset will have to annul (by a regular majority) Article 5 of Basic Law: Jerusalem so as to change the municipal boundary of the city, removing the neighborhoods and setting up new local councils of them. The plan is good for Israel. It will remove about one-third of the Arab population from the city so that the Jewish share of the population will come to 69 percent instead of 59 percent at present. The City of Jerusalem will free itself from an economic burden, one that it could not contend with even before the building of the fence. Unlike other plans for the division, such as Haim Ramon’s plan, the territory will not be transferred to the Palestinian Authority, neither all at once nor gradually. Israel will not lose intelligence accessibility and preventive and operational capabilities within these neighborhoods, thereby averting a potential threat. Such a threat materialized in the past when Israel transferred the Beit Jalla area to the PA, and the adjacent Gilo neighborhood came under fire for years. The plan is good for the residents. The residents will gain two local councils that will be budgeted by the state like any other council. They will be able to improve their situation considerably and invest more funds in infrastructures and services – two very neglected areas in their neighborhoods. From an urban standpoint, they will not be dependent on the will of the decisive Jewish majority, which administers their affairs today. Unlike in the plans for dividing the city, the Arab residents will maintain their resident status with the many rights and benefits that it entails. The residents will not be left to their fate after almost 50 years of Israeli rule, and they will not be transferred to the PA, something many of them do not want. Matching grants and government budgets that meet the needs of the population are a prerequisite for implementing this plan. Other ideas that have been raised in recent years about these two neighborhoods have generally focused either on the distress of their residents or the Israeli demographic interest. The “One (Israeli) Sovereignty – Municipal Division” plan addresses both of these issues and provides a solution to three concerns: the security interest, the demographic interest, and the residents’ distress. The plan does not put this area, now or in the future, in the PA’s hands. It does not jeopardize Israeli’s security control of it, which is vital to maintaining security in the adjacent Jewish neighborhoods and Jerusalem in general. The plan, for the first time, assumes real responsibility for the rehabilitation of these neighborhoods and makes the residents part of the endeavor. The plan does not ignore the Israeli demographic interest in Jerusalem; nor does it nullify the residency status of the Jerusalem population living in the area that was already moved outside the fence. Unlike other plans, this is not a plan for the division or relinquishing sovereignty, but for municipal separation from only two neighborhoods, which were already removed from the city de facto by the construction of the fence. The two neighborhoods’ situation and status are essentially different from the situation and status of east Jerusalem neighborhoods that remain inside the fence. As noted, these two neighborhoods will cease to be part of Jerusalem but will continue to be part of Israel. Now under discussion in the government, the National Security Council, the Knesset, and among the public are various initiatives that could dramatically change the boundaries of Jerusalem. The main one, which this paper explores, was first formulated about three years ago at the Jerusalem Center for Public Affairs by Nadav Shragai in his book Jerusalem: Delusions of Division. Removal of the northern Jerusalem Arab neighborhoods, which were left outside the security fence, from the municipal boundaries of Jerusalem, while keeping them within sovereign Israeli territory. The Interior Ministry will set up two separate local authorities for them after appropriate legislation. The neighborhoods are Kafr Akab and the Shuafat refugee camp, along with their adjacent areas. Unlike in other plans that have been proposed, the Kafr Akab-Shuafat area where about 140,000 people now live – about a third of the population of east Jerusalem – will not be transferred to the Palestinian Authority or to the authority of the West Bank Civil Administration. The residents will retain their residency cards and will be residents of the state of Israel but not of Jerusalem. The proposed change is solely municipal and does not entail a separation of sovereignty. It is important to emphasize: the Kafr Akab-Shuafat area has already been removed de facto from the boundaries of Jerusalem by the building of the security fence. 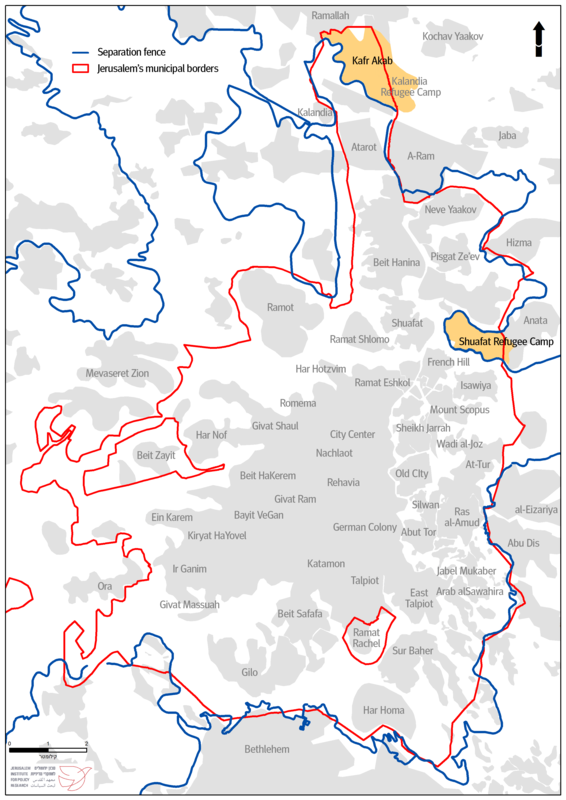 The situation in this vicinity is fundamentally different from the situation in the east Jerusalem neighborhoods that have remained “inside the fence.” Thus, the municipal separation from the Kafr Akab-Shuafat area will not be a precedent for a similar separation from other Arab neighborhoods. Other ideas that have been raised concerning these two neighborhoods in recent years have focused on one of two main issues: the distress and severe neglect suffered by the population, or the Israeli demographic interest. This plan addresses both of these issues. To improve the dire situation of the residents of Kafr Akab and the Shuafat refugee camp. When the security fence was built to the south of these neighborhoods 14 years ago, it only exacerbated the neglect, crime, poverty, and ungovernability that had already plagued them. In recent years, these neighborhoods have been called a “no man’s land” in which “severe distress and chaos” prevail. 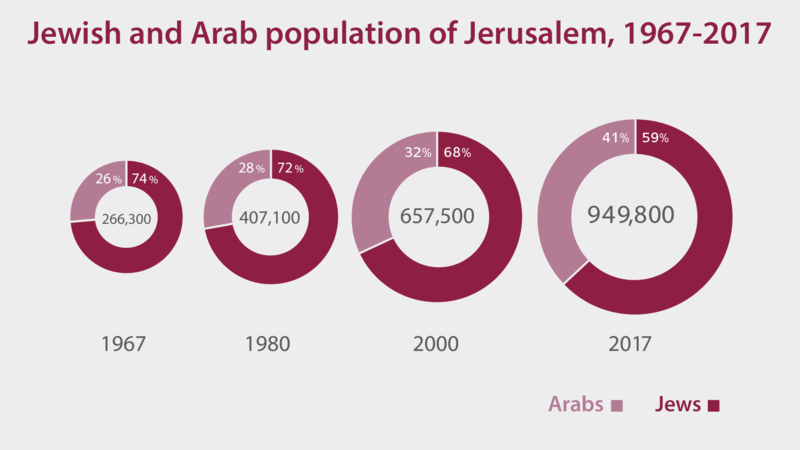 To alter the Jewish-Arab demographic balance in Jerusalem so that the Jewish majority, which has been shrinking for years, will again increase substantially. In the second half of 2017, two bills backing the initiative were submitted to the Knesset. One includes a set of amendments to Basic Law: Jerusalem, Capital of Israel, which was approved by the Knesset after three readings on January 1, 2018. The main amendment, which was initiated by Minister Naftali Bennett, stipulates that the existing legal prohibition on transferring any part of Jerusalem to a foreign party can now be overturned only by a majority of 80 members of Knesset instead of the current 61 member majority. The new article itself can be reversed only by a majority of 61 members of Knesset and not by a regular majority. Another implicit, important change, which directly concerns the subject of this paper, stipulates that no territory that currently is part of the City of Jerusalem can be transferred to a foreign party – even if it is removed in the future from the boundaries of the city – except by a majority of 80 or more members of Knesset. This amendment was initiated by Jerusalem Affairs Minister Elkin, who supports the plan for a municipal division of the northern Arab neighborhoods. Unlike Elkin’s original intention, and unlike the version that passed in the first reading, the second and third readings of the law clarify that removing territory from the municipal boundaries of the city will require the approval of the Knesset, but with a regular majority only. In contrast to the present situation, the interior minister will not be able to make such a change without Knesset legislation. 1. Expanding the jurisdiction of Jerusalem to include the Jewish communities Maale Adumim, Gush Etzion, Efrat, Givat Ze’ev, Beitar Illit, and Mevaseret Zion. 2. Removing the northern Jerusalem Arab neighborhoods that were left beyond the fence (Kafr Akab and the Shuafat refugee camp) from the boundaries of Jerusalem, while keeping them within sovereign Israeli territory and the umbrella municipality. This proposal is similar to the one outlined in the book Jerusalem: Delusions of Division (the One Sovereignty – Municipal Division plan). Unlike it, however, it would also make the Shuafat and Kafr Akab municipalities sub-municipalities of the umbrella municipality, like the municipalities of Maale Adumim and Givat Ze’ev, and their residents would also keep voting in the Jerusalem-municipality elections.7 This proposal is very similar to the plan advanced by Minister Elkin, who, as noted, has adopted most of the One Sovereignty – Municipal Division plan. Minister Elkin would likewise retain the Shuafat and Kafr Akab municipalities as sub-municipalities within the umbrella municipality, but his plan would not allow their residents to continue to vote in the Jerusalem-municipality elections. This paper explores the background, the processes, the advantages, and the complexity involved in removing the two Arab neighborhoods from Jerusalem’s jurisdiction and also considers other plans that address the same issue. It concludes that the advantages of the One Sovereignty – Municipal Division plan are many and that its complexity can be dealt with successfully. How Were Kafr Akab and the Shuafat Refugee Camp Added to Jerusalem? At that time, the two neighborhoods under discussion here numbered only about 4,500 residents,11 who constituted six percent of the total of 70,000 residents of east Jerusalem (about 3,500 in the Shuafat refugee camp and about 1,000 in Kafr Akab). Today these neighborhoods number about 140,000 residents, who constitute about a third of all east Jerusalem residents. Their built-up area has already greatly expanded. Below we will consider the huge population growth in these neighborhoods, its causes and sources, and the clear-cut connection between this growth and the building of the security fence. Shuafat, the only West Bank refugee camp that was included in Israeli territory, was established by Jordan in 1965. Its original residents were Arab refugees from west Jerusalem who had settled in 1948 in the ruins of the Jewish Quarter and were then evacuated to Shuafat during the Jordanian period. After the Six-Day War, more refugees from that war joined them. Thus, in 1967 Ze’evi’s letter already spoke of the possibility of a municipal separation, not about a change of sovereignty. The letter was recently disclosed by Dr. Amnon Ramon in his book Residents, Not Citizens (Hebrew), published by the Jerusalem Institute for Policy Research. Ramon notes that Ze’evi realized that the plan he had presented might be too far-reaching, and hence offered the government a possible alternative. Nowadays, the same principle stands behind the proposal to separate the northern Arab neighborhoods from Jerusalem and to establish a council or two separate councils for them, while at the same time keeping them within the state of Israel. Jerusalem has had a Jewish majority since the mid-19th century, and as Jews returned to the Old City and the holy places, the desire to create and maintain a stable Jewish majority in the united capital city of Israel and the Jewish people was a natural development. Israel’s demographic policy in Jerusalem was directly influenced by the fact that for 19 years, from 1948 to 1967, the city was divided. The country’s leaders did not conceal their apprehensions about the Arab minority, which constitutes a majority in the areas it inhabits. They feared that one day the Arab residents of Jerusalem, who had now been incorporated within the state of Israel, would demand the fulfillment of national aspirations—whether through a re-division of the city, becoming part of an independent Palestinian entity, or in some other way. Two people who have observed the great weight of the demographic factor in crafting and implementing Jerusalem policy are Israel Kimchi, a researcher at the Jerusalem Institute for Policy Research and former head of the Planning Department of the Jerusalem municipality, and David Kroyanker, one of Jerusalem’s leading architects. The two current political-urban strategies are an attempt to change the trend and the reality: on the one hand, the creation of an umbrella municipality that will annex to the city – in an initial, administrative stage – the Greater Jerusalem Jewish settlements such as Maale Adumim, Efrat, and Givat Ze’ev; on the other, the municipal removal of the Shuafat refugee-camp and Kafr Akab neighborhoods from the boundaries of Jerusalem. As noted, those two neighborhoods now number about 140,000 people, and they have bordered the northern route of the fence since it was built in 2003. On March 29, 2002, in the wake of the suicide bombing at the Park Hotel in Netanya that killed 30 Israelis, the IDF launched Operation Protective Shield. By the time it ended weeks later on May 10, the terror attacks had decreased substantially, and most of the terror infrastructures in the PA-controlled part of the West Bank had been destroyed. The Kafr Akab area was moved outside the fence because of the conditions of the area and the building congestion, which made it impossible to build the fence between Kafr Akab and the outskirts of Ramallah. The same was true of the Shuafat refugee camp, which could not be separated from Kafr Anata. The refugee-camp area is also known to include a large number of “illegal residents” and to be a very problematic, lawless zone that the security authorities have usually refrained from entering. The huge gaps in the quality of infrastructures and services between Jerusalem’s Jewish and Arab neighborhoods have been well known for many years. Much has been spoken and written about the problem. 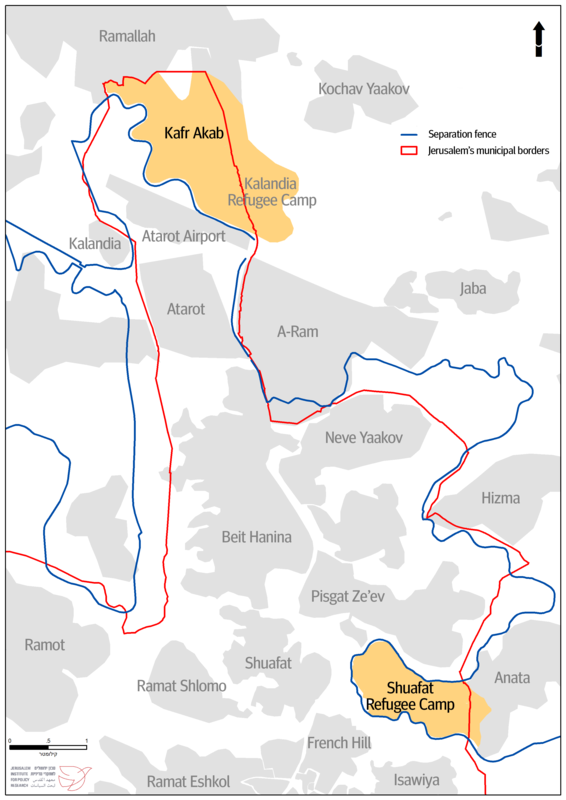 Although these disparities are not the main concern of this paper, they need to be briefly described to make clear that the situation in Kafr Akab and Shuafat was already difficult before the fence was built and then got even worse. There are gaps of hundreds and sometimes thousands of percentage points between the Jewish and Arab neighborhoods in almost every regard: sidewalks, roads, public parks, kindergartens, schoolrooms, public cleanliness, drainage, sewage, lighting, and so on. With regard to construction, too, for many years the Israeli authorities greatly delayed the preparation of master plans and detailed plans for the Arab neighborhoods and villages of east Jerusalem. In the absence of proper planning, building activities in these areas were permitted under Article 78 of the Planning and Building Law. Apparently, this article was intended to solve problems ad hoc for a short period, until proper plans were prepared. The article was, however, used abundantly, almost limitlessly. As a result of this, and of very large-scale illegal Arab construction – in part as a consequence of the lack of proper planning – the Arab construction developed in a way that was sporadic, disorganized, and lacking in overall neighborhood planning. Separate one- or two-story stone houses were built, dispersed around a steep topography; means of access were few, narrow, winding, and unpaved; individual cesspools served numerous residents instead of a proper sewage and drainage system. The lack of land regulation – that is, proper registration of the ownership of extensive lands in east Jerusalem – hampered the proper planning and development of these lands even more. The first official to grasp the severity of the situation and raise the matter publicly was the “right-winger” Yakir Segev. A member of the Jerusalem city council, an associate of Mayor Nir Barkat and member of his party, Segev was responsible for the eastern part of the city. In a student gathering at the Hebrew University of Jerusalem in the winter of 2011, Segev said that the Palestinian neighborhoods beyond the separation fence were “already not part of the city” and that “the reality that has been created on the ground is irreversible.” He added that the fence had been built for political-demographic and not only security reasons. Indeed, over the years Kafr Akab (67 percent of which is within the Palestinian Authority, the rest within Israel and the City of Jerusalem) and the Shuafat refugee camp with its outskirts have suffered physical neglect. Poverty, decrepitude, dirt, crime, high use and trade in drugs, widespread building transgressions, and terror activity prevail. Shuafat residents own numerous unregistered weapons, which not infrequently find their way to terror operatives and organizations. The City of Jerusalem has provided services to these neighborhoods meagerly and with difficulty, and the same is true of other civilian authorities – even though, as noted, these places are formally part of the state of Israel and the Jerusalem municipality. Piles of garbage in the neighborhood of Semiramis-Kafr Akab. Garbage, which was removed only sporadically, was burned by the residents in the streets, producing an environmental hazard and a stench. Water supply was irregular. The drainage and sewage system was decrepit and sometimes did not function at all. In an attempt to get rid of the sewage, the residents not infrequently drained it into the drinking-water system. Physical infrastructure, including roads, sidewalks, educational buildings, and so on, was defective. Public transportation was meager and insufficient. Conflicts between neighbors and even graver criminal incidents, involving the drug trade, violence within families, theft, and so on, were not addressed by the police. The vacuum was filled by criminal and terror elements. When the municipality occasionally tried to send its workers into these neighborhoods, they were attacked and had to flee. Indeed, in the wave of stabbing and ramming attacks in Jerusalem from 2014 to 2017, terrorists from the Shuafat area played a prominent role. The “Jerusalem envelope” communal administration, which the state established in 2006 for the neighborhoods that were left outside the fence, indeed operated over the years but to meager effect. Only recently the municipality has improved garbage removal from these areas, and in Shuafat, the police have opened a combined service center that is supposed to respond to routine complaints and, in the future, to include municipal and governmental services such as National Insurance, the municipal departments, and rescue services. Both municipal and governmental budgets have grown compared to the past. The Gihon Water Company has greatly increased its activity in Shuafat and improved service for the residents. Still, these changes are a drop in the bucket after 50 years of neglect. The greatly increased construction has expanded the built-up areas. The Jerusalem municipality’s building inspectors have vanished from the scene. Sometimes criminals have taken over areas that did not belong to them and built homes on them. The lack of an operative master plan, or even of specific building plans, has made the problem all the worse. Plans that were on paper have become meaningless as the building is carried out even in places where roads and other facilities had been planned. In 1967, after the unification of Jerusalem and the expansion of its territory, there were 4,500 people living in the Shuafat refugee camp and Kafr Akab. In 2003, with the building of the separation fence, about 45,000 people lived in those two places. Since 1967, the population in those two neighborhoods and their outskirts has grown 31 times larger, and what has actually emerged are new neighborhoods. In the same time span, the population of all of east Jerusalem has grown only 5.7 times larger, from 68,00037 to 391,000. The building of the separation fence almost immediately prompted tens of thousands of official Jerusalem residents, who until then had been living outside the municipal boundaries of the city, to move within those municipal boundaries. Some of the returnees settled in Jerusalem outside the fence, in Kafr Akab and Shuafat, but most went to live in east Jerusalem on the “Israeli,” southern side of the fence. The returnees feared to lose the rights entailed by the residency cards they possessed: many social rights, and especially the right, and convenient access, to the same health services provided to the Jewish population (under the National Health Insurance Law). Jerusalem residents from the Kafr Akab-Shuafat area, who, with the building of the fence, crossed over to its “Israeli” side on the south, and now have returned to Kafr Akab-Shuafat because they could not afford the housing on the “Israeli” side. In Kafr Akab-Shuafat beyond the fence, within what is now defined as Israeli Jerusalem, a new, additional status of the residents has gradually emerged. The common residence of tens of thousands of PA residents who have migrated there from the West Bank, and do not hold a Jerusalem residency card, with the original Jerusalemites – tens of thousands who live there and do hold a Jerusalem residency card – has resulted in marriages between the two groups. Given the nature of common residence, this process is only at its inception. The children of these couples are entitled by Israeli law to a Jerusalem residency card because they were born in Jerusalem and lived in it. Thus, even if today about half of the 140,000 residents of the northern neighborhoods beyond the fence are original residents who hold an Israeli residency card, in another generation or two numerous children who have been born to “mixed” couples from the PA and east Jerusalem will also become residents. This fact is of great demographic weight. The difficult reality prevailing in the Kafr Akab-Shuafat area, the fence that has exacerbated the difficulty, and the demography of the area, which has changed greatly in recent years, do not permit a solution in the Israeli “zbang v’gamarnu” (“One big move will finish the job”) style. Those who propose transferring these neighborhoods to the PA’s responsibility – even if it is done gradually – ignore or belittle the severe security danger entailed by such a step. Others, who propose continuing the existing situation and assume that now, after 50 years, the Jerusalem municipality will begin to funnel huge budgets into rehabilitating these neighborhoods, are afflicted with excessive optimism. The former belittle the chaos and distress that have emerged in these neighborhoods, and the latter belittle the demographic reality that has emerged in them. The plan proposed here, which is also the plan promoted by Minister Elkin, is a good compromise between those two approaches. Indeed, it too is not perfect, but it takes a comprehensive view of the three foci of the problem: security, demography, and the residents’ distress. It offers clear-cut advantages both to the state of Israel and to the Arab residents. The Arab neighborhoods in northern Jerusalem – the Shuafat refugee camp and its outskirts, Ras Hamis, Ras Shehada, and Dahiyat al-Salaam, along with Kafr Akab-Semiramis and their sub-neighborhoods, all of which were left north of the security fence – will be removed from the municipal boundaries of Jerusalem. These neighborhoods will remain within the state of Israel and under Israeli sovereignty. Two separate municipal authorities will be established for them. Their inhabitants who currently hold residency cards will continue to hold them, and they will not be annulled. After the government and the Knesset approve this plan, implementation will be entrusted to the Interior Ministry. The interior minister, on the basis of the authority invested in him by the Municipalities Ordinance, will set up an investigatory commission, and after examination of the committee’s review – as required by the law – an announcement will be published on the establishment of the new councils and the change in the municipal boundaries of the city of Jerusalem. The establishment of the authorities will formally remove from the area of the city about one-third of the Arabs now living in it. The action will improve the demographic balance in the Jewish side’s favor, with the Jews constituting 69 percent of the city’s population and the Arabs 31 percent. Currently, the ratio is 59:41 in the Jewish side’s favor. Implementing the plan is not complicated from a political standpoint since it involves a territorial unit that is already under Israeli sovereignty. The procedure of changing the zone of jurisdiction of a local authority is anchored in Articles 3 and 8 of the Municipalities Ordinance. After the Knesset gives its approval, the government will be able to authorize the interior minister to act on this matter. The city of Jerusalem will free itself from a heavy burden with which it did not cope successfully even before the building of the fence. The municipality will be able to invest more in the Arab neighborhoods that will remain in Jerusalem, working to reduce the gaps in infrastructures and services between them and the Jewish neighborhoods. Unlike the plans for a division of the city promoted by Haim Ramon and Bill Clinton, the neighborhoods will not be transferred to the PA or to a Palestinian state, neither gradually (as part of Area B only, as some of the plans propose) nor all at once (as part of Area A, as other plans propose). Israel will not lose intelligence access and preventive and operational capabilities in these neighborhoods, and will even be able to improve them. The residents will gain two local authorities with local-council heads and members, which will be budgeted by the state of Israel like any other council within its territory. These councils will be able to improve the situation considerably, set orders of priorities, and invest more funds in infrastructures and services – two areas that have been almost completely neglected in these neighborhoods. The neighborhoods will not be dependent in urban terms on the will of the large Jewish majority, which administers them today, but will be able to run their affairs themselves subject to Israeli laws and regulations. Unlike in the plans for a divided city, the Arab residents will retain their residency status, which entails many rights and benefits. They will neither be “thrown into the street” after almost 50 years of Israeli governance nor transferred to the PA, something many of them fear and do not want. Against all these concerns stands the fact that for the past 50 years the Jerusalem municipality has directed almost none of the budgets, high revenues, and targeted budgets at its disposal to rehabilitating these neighborhoods. The municipality has invested very meagerly in basic services and infrastructures for these neighborhoods and has made almost no use of its quality professional personnel on their behalf. Matching grants and governmental budgets that suffice for these needs are a threshold condition for implementing this plan. According to the main amendment of Basic Law: Jerusalem, Capital of Israel, it will not be possible to transfer territories from Jerusalem to foreign sovereignty except with a majority of at least 80 members of Knesset. This restriction will also apply, therefore – as per the amendment – to territories that are removed from the city of Jerusalem in the future. In other words, it will likewise be impossible to transfer the territories of the new councils – the Shuafat refugee camp and Kafr Akab – to foreign sovereignty with less than an 80-member-of-Knesset majority, just as it will be impossible to transfer any parts of Jerusalem to foreign sovereignty with less than such a majority. As long as the residents there continue to believe that, they will remain where they are. If the plan that this paper proposes is adopted, the probability that they will not change their place of residence will increase. The plan explicitly stipulates that the residents of the neighborhoods beyond the fence who now hold residency cards will not lose them. This point must be explained to the residents, particularly because other plans threaten to take away their residency cards. It is those plans, and not the One Sovereignty – Municipal Division plan, that are likely to precipitate a mass influx of Jerusalemite residents from the Kafr Akab-Shuafat refugee camp area to Jerusalem “inside the fence.” In any case, one must take into account a possibility that a small number of residents who hold Jerusalem residency cards will decide anyway to move to the “Israeli” side of the fence. So long as it is a small number, Jerusalem will be able to contain the phenomenon. A demographic gain – Another issue that was raised about the plan presented here concerns the “demographic gain.” What is the difference between 140,000 Arabs living within Jerusalem that is part of Israel and 140,000 Arabs living outside the municipal boundaries of Jerusalem but still within Israel and within Metropolitan Jerusalem? The answer is that Israel can allow itself to absorb an additional 140,000 Arabs but Jerusalem cannot allow itself to do so. This is because the Arabs of east Jerusalem could, one day, change their “boycott” approach and take part in Jerusalem’s municipal elections. That Arab residents of the city should take part in the “demographic game” and be represented on the city council is proper, desirable, and legitimate. At the same time, the constant growth of the Arab minority in Jerusalem and decrease of the Jewish population, possibly to the point of equivalency or even beyond that, is a trend that must be taken into account. There is a difference between representation on the city council for 31 percent of the city’s residents and representation on the council for 41 percent – or, in the future, even more – of the residents. Jerusalem now is a bi-national city. That reality will not change. The difference concerns the size of the Arab minority and the possibility of preserving the Jewish majority. Separation – Finally, a further question was raised: How can one separate the Jerusalemite residents who live in Kafr Akab and Shuafat from the tens of thousands of illegal residents who have come from the PA? There is no good answer to this, apart from noting the fact that even today such a separation does not exist. It is impossible to surround these two neighborhoods with fences on all four sides. One fence already separates them from Jerusalem, and it was built for security reasons. Moreover, as we have seen, as time passes, PA residents and east Jerusalem Arabs who live together in the neighborhoods beyond the fence marry each other and raise families. Their children, who are born in these places and keep living in them, also automatically become residents who in the future will have the right to vote for the Jerusalem city council. Removing these neighborhoods from Jerusalem in the form of separate local authorities, as we have proposed, is what will prevent this. The Oslo agreements – Annex 1 of the Declaration of Principles on Interim Self-Government Arrangements (Oslo 1) that was signed with the PLO on September 13, 1993, states that “Palestinians of Jerusalem who live there will have the right to participate in the election process” for the elected council of the Palestinian Authority. This principle was extended in the second annex of the 1995 Interim Agreement between Israel and the PLO (Oslo 2). Removing the Arab residents from the municipal boundaries of the city, as envisaged by the One Sovereignty – Municipal Division plan could create a problem for Israel. Seemingly this measure would indeed deny those east Jerusalem residents – who would cease to be residents of Jerusalem – the right to vote for the Palestinian council as promised in the agreement. Alan Baker, the former legal adviser to the Foreign Ministry and the director of the Institute for Contemporary Affairs at the Jerusalem Center for Public Affairs, believes this difficulty can be resolved. In his view it can be stipulated, legislatively or according to the regulations by which the One Sovereignty – Municipal Division plan will be implemented, that the change in residency status of the Jerusalemites who are removed from Jerusalem will not compromise those residents’ right to take part in the elections for the Palestinian council as per Annex 1 of the abovementioned Declaration of Principles. Main elements of the plan: most of the Arab neighborhoods within the municipal boundaries of Jerusalem will be transferred to the PA and defined as B areas (Israeli security control and Palestinian civilian control). A fence, whose precise route “will be based on considerations of security, demography, and daily life,” will separate these areas from Jewish Jerusalem. The Berko plan, similar to the Ramon plan, regards these neighborhoods as a “security, political, economic, and demographic burden on Israel.” However, Member of Knesset Berko does not (unlike in the Ramon plan) propose implementing the plan unilaterally but only with Palestinian reciprocation and in coordination with the United States. In the future, she writes, “a date will be set for determining the residents’ status in the PA and for canceling their residency status.” The expiry of the residency status will be gradual. According to media reports, the Berko plan envisions that eventually the Palestinian neighborhoods defined at first as B areas will be transferred, with their 300,000 residents, to full PA control and become A areas. However, the Old City, the Holy Basin, the neighborhoods built in Jerusalem after 1967, and the Jewish satellite neighborhoods will remain under full Israeli control and be part of the capital of Israel and of Greater Jerusalem. In addition, the Israeli corridor to Maale Adumim (the E1 neighborhood) will be built. If the Berko plan is implemented, the Jewish majority in the city will reach 85 percent. A significant improvement in the demographic balance – a Jewish majority of 75 percent in the Ramon plan and of 85 percent in the Berko plan. In the Ramon plan, the measure is unilateral, without necessarily any reciprocation from the other side. The Israeli experience with unilateral steps is negative. The most notable of these failed attempts is the disengagement plan. Abandoning any effort to ameliorate the conditions and rehabilitate the Shuafat refugee camp and Kafr Akab, with all that this entails. A reasonable possibility that other Jerusalem neighborhoods that will be moved outside the fence will deteriorate to the condition of Kafr Akab and Shuafat with increased poverty, neglect, crime, terror, hostility, and distress, similar to what happened in Kafr Akab and Shuafat after they were moved outside it. A moral “betrayal” of most of the east Jerusalem Arabs, who want to keep living in the united city under Israeli sovereignty. A de facto division of Jerusalem, something most Israeli governments have opposed for 50 years. A severe blow to the economy of both the western and eastern cities, which are interconnected.56Tens of thousands of Arabs are employed in the western city, and its economy now depends on them. The claim that such a step will lead to a large financial and budgetary gain has not been sufficiently examined. For example, notwithstanding their image, many east Jerusalem residents do pay property tax to the Jerusalem municipality for fear of losing their residency cards. In 2016, for example, the municipality collected a total of 225 million shekels in property tax from east Jerusalem Arabs. And the economic benefit to Jerusalem of having tens of thousands of Arabs employed in the city is yet to be estimated. Continued Israeli security control without PA involvement, and continued Israeli sovereignty. Another attempt, after 50 years, to rehabilitate the east Jerusalem neighborhoods in general and those beyond the fence in particular. Uncertainty about the chances of a substantial change in the difficult and complex situation of these neighborhoods, as described above. Insufficient attention to the continuing threat to the Jewish majority in the city, a threat in which the northern neighborhoods beyond the fence play an increasing role. The bill also decides the outcomes of the future permanent-status negotiations on Jerusalem in advance. What the proposal entails is that Israel relinquishes east Jerusalem even before negotiations have begun, which is not what was agreed upon in the Oslo documents. The northern Arab neighborhoods of Jerusalem beyond the fence have become a demographic time bomb and an island of distress, crime, terror, the absence of authority, and ungovernability. The One Sovereignty – Municipal Division plan addresses the two foci of the problem: both the demographic threat and the social-urban chaos that has emerged in these neighborhoods. A threshold condition for implementing the plan is funding, along with genuine willingness to invest the money, through the new councils, in appropriate amounts and in areas where the Jerusalem municipality has not invested so far. The other ideas raised in recent years – unilateral separation from most of the neighborhoods and villages in east Jerusalem, moving them outside the fence, and even transferring them to the PA – entail dividing Jerusalem and the danger of a security deterioration. These ideas are also highly likely to foster precisely the processes that occurred in Kafr Akab and Shuafat after they were moved outside the fence. Other areas that are moved there will also become ungovernable no man’s lands, neglected and poor, lagging in economic and urban terms. It is possible instead to ameliorate the discrimination between the Jewish and Arab populations when it comes to investing in infrastructures and services. This can best be done by setting up separate local authorities under Israeli rule. The currently existing gaps between the two populations are unacceptable, but division is not a solution. The severe neglect and the need to put an end to it cannot justify a much greater error – a division of Jerusalem, which poses dangers that are multiple and grave. The situation in all parts of east Jerusalem cries out for amelioration. But the Kafr Akab-Shuafat area, which was left outside the fence, requires a special effort, as outlined in the plan proposed here. It is a slum, with no sidewalks, no functioning sewage system, no garbage collection, no postal service, no open spaces, no parks, and no playgrounds, and no police protection to keep order and provide security for its residents. It is infested with criminal gangs in possession of automatic weapons, and there are pushers selling drugs to adults and children. Killings are almost weekly occurrences. In Shoafat there is no law and there is no order…. Baha [Nababta], a 29­year-old community worker, had initiated a one-man effort to bring about some improvement in the miserable situation of Shoafat…. His efforts evidently ran counter to the interests of some of the criminal elements in Shoafat…. Baha was murdered. It is likely that no one is looking for his assailant. There is no police in Shoafat. Israeli governments had 49 years to rehabilitate the refugees in the camp and turn Shoafat into a livable neighborhood. The Israeli police had 49 years to establish law and order in Shoafat. The Jerusalem municipality had 49 years to establish proper municipal services there. Next to nothing was done…. Even if during the year that has passed since those words were written there appear to be real beginnings of a change, the impression is that it is already too late and one must think outside the box. The One Sovereignty – Municipal Division plan addresses the main considerations for the state of Israel and the residents of the area. Its implementation should be considered favorably. * Most of the articles cited in the endnotes are in Hebrew. 1 Proposed law “Jerusalem and Its Daughters,” 2017, פ/20/4386. Submitted to the Knesset on July 10, 2017. 2 For a consideration of Elkin’s plan, see Nadav Shragai, “Outside the City of Jerusalem, inside Israeli Territory,” interview with Minister Ze’ev Elkin, “Israel Hashavua,” supplement of Israel Hayom, August 4, 2017, pp. 4-5; Yaki Adamker, “Separation or Widening Boundaries: The Best Proposal for Improving the Situation in Jerusalem,” Walla website, November 7, 2017. 3 From Channel 10 news, Nana 10 website, Yossi Eli and Akiva Novik, “A Plan That the National Security Council Is Examining…,” May 24, 2017. 4 The plan was also adopted by a team of experts on Jerusalem affairs, as part of a more comprehensive set of measures in a plan called Magen Yerushalayim (Jerusalem Shield). The plan was submitted to the prime minister in the spring of 2017. The team included Haim Silberstein, Alan Baker, Muni Ben Ari, the architect Yoram Ginsburg, General (res.) Gershon Hacohen, Yoram Ettinger, and Nadav Shragai. 5 Proposed law “Jerusalem and Its Daughters,” 2017, פ/20/4386. Submitted to the Knesset on July 10, 2017. 6 According to data of the Jerusalem Institute for Policy Research, the new territory of the city, to be created as stipulated by the law, comes to 193 square kilometers (193,000 dunams). This territory constitutes an addition of 67,800 dunams to the city, whose size is now 125,000 dunams. According to the institute’s data, the new city will have more than a million (1,020,000) residents. The share of Arabs in the population will be 33 percent, compared to 38 percent in Jerusalem today. The share of Jews in the population will be 67 percent, compared to 62 percent in Jerusalem today. 8 Hezki Baruch, “Netanyahu Blocked the Greater Jerusalem Law,” Channel 7 website, October 28, 2017. 10 For more, see Ramon, Residents, Not Citizens, pp. 27-67. 12 Nir Hasson, Urshalim, Yediot Sfarim, 2017, p. 47. 13 Uzi Benziman, A City without a Wall, Schocken, 1973, p. 253. 14 Nadav Shragai (research assistant: Yael Gold), Planning, Demography, and Geopolitics in Jerusalem, Jerusalem Center for Public Affairs, 2010, p. 9. 15 Nadav Shragai, “A Shrinking Majority,” “Israel Hashavua,” supplement of Israel Hayom, November 10, 2017. See also statements by Israel Kimchi, director of Jerusalem research at the Jerusalem Institute for Policy Research. 16 Ilan Ezrachi, Sane in Her Dream, self-published, 2017, p. 109. 18 Shragai, Planning, Demography, and Geopolitics, p. 11. 19 Shragai, Jerusalem: Delusions of Division, Jerusalem Center for Public Affairs, 2015, p. 42. 21The data are taken from Ramon, Residents, Not Citizens, pp. 256-257. 22 General Security Service, “Special Survey: Involvement of East Jerusalem in Terror Activities,” September 2008. 23 In 2015 1.22 million people lived in Metropolitan Jerusalem. Of these, 865,700 lived in the City of Jerusalem and 358,100 in surrounding communities (Maya Choshen and Michal Korach, Jerusalem: Fact and Trends, Jerusalem Institute for Policy Research, pp. 34-36). Already on June 21, 1998, the government adopted Decision 3913, “Strengthening Jerusalem,” which called for setting up an umbrella municipality within three months. About half a year earlier the government had adopted Decision 3141, which defines the Jerusalem area as “a vital national interest of the state of Israel.” The former decision was declarative. The second was operative, but because of U.S. pressure it was not implemented. 24 As Olmert told me at the time. 25 As members of the professional echelon told me at the time. 26 The data were graciously provided by Israel Kimchi, director of Jerusalem research at the Jerusalem Institute for Policy Research. 27 Dr. David Koren, “East Jerusalem: End of the Interim Period,” article on the Jerusalem Institute for Strategic Studies website. 28 Thus, for example, the assistant to the mayor for east Jerusalem affairs, David Koren described this effect as follows: “The fence cut off the Jerusalem Arabs within the fence from Ramallah and the West Bank and only further strengthened their connection to the employment, welfare, health, and economic infrastructures in West Jerusalem, and to the Jewish society in Jerusalem” (ibid.). 29 In a conference at the Menachem Begin Heritage Center organized by the Jerusalem Institute for Strategic Studies in November 2017, Yoram Halevy, commander of the Jerusalem District Police, said that whereas in Shuafat the Jerusalem District Police bears responsibility and had recently stepped up its activity there, in Kafr Akab the IDF bears responsibility. 30 Hasson, Urshalim, p. 80. 31 Nir Hasson, “Yakir Segev, Holder of the East Jerusalem Portfolio in the Jerusalem Municipality: The State of Israel Has Relinquished the Neighborhoods outside the Separation Wall,” Haaretz website, January 8, 2010. 32 Pollock’s lecture at the Jerusalem Institute for Policy Research at the end of 2015. I documented his words and published them in the “Israel Hashavua” supplement of Israel Hayom, “A Worthless Thing,” September 18, 2015. 33 Source: the Jerusalem municipality and the Jerusalem Institute for Policy Research. 35 An estimate of the Gihon Company and of a researcher at the Jerusalem Institute for Policy Research. 37 Dr. Maya Choshen, “Population and Growth of the Population in Jerusalem 1967-2006,” in Ora Ahimeir and Yaakov Bar-Siman-Tov, eds., 40 Years in Jerusalem, Jerusalem Institute for Israel Studies, 2008, p. 21. 38 The threat of cancellation of residency status has already hovered over the east Jerusalem Arabs for years and affects their behavior. Since 1967 the residency status of about 15,000 people has been canceled. Nadav Shragai, “The City Was Mixed Together,” Hashiloach 4, May 2017, p. 116. 39 Shragai, Jerusalem: Delusions of Division, p. 55. 40 Ramon, Residents, Not Citizens, p. 260. 41 On the Arab migration patterns in the Jerusalem area since the building of the fence, see Dr. Maya Choshen, “The Population of Jerusalem: Processes of Change,” in Ora Ahimeir and Yaakov Bar-Siman-Tov, eds., 40 Years in Jerusalem, Jerusalem Institute for Israel Studies, 2008, pp. 34-35. 42 The number of these is not clear. Some researchers give high numbers while others give low ones. Professionals and evaluators are now looking into the issue. 43 For more on these difficulties and limitations, see Israel Kimchi, “The Functional and Metropolitan Setup of Jerusalem,” in Ora Ahimeir and Yaakov Bar-Siman-Tov, eds., 40 Years in Jerusalem, Jerusalem Institute for Israel Studies, 2008, p. 153; Shragai, Planning, Demography, and Geopolitics, pp. 33-34; Hasson, Urshalim, pp. 118-120. 45 On the government’s policy on this issue, see the announcement of the cabinet secretary at the end of the government’s meeting on April 23, 2017, extending the validity of the temporary order. Ibid. 46 For more on the reasons for this temporary order, which also had a “demographic aspect,” see Ramon, Residents, Not Citizens, pp. 264-274. 47 For more on the threat of terror and shooting at Jewish neighborhoods in Jerusalem, and on the PA’s attitude toward terror, see Shragai, Jerusalem: Delusions of Division, pp. 71-108. 48 In 2015 189 nine local authorities, out of the 257 local authorities in Israel, were entitled to a matching grant. 49 The average property-tax collection rate in east Jerusalem stands at 51 percent, compared to 66 percent in the city as a whole (Jews and Arabs). 50 In “Explanation of the Significance of the Amendments to the Amendments of Basic Law: Jerusalem, Capital of Israel, by Member of Knesset Shuli Muallem-Refaeli and Others,” November 6, 2017, p. 2. The document was written by the legal adviser to the Knesset and submitted to the Constitution, Law and Justice Committee of the Knesset as the bill was being prepared for a second and a third reading. 51 For more on local authorities that have such committees, see Ilanit Bar, “Local Authorities in Israel That Are Run by a Supervisory Committee,” Knesset Research and Information, Department of Budgetary Development, submitted to the Finance Committee on January 14, 2011. 52 Details of the plan are taken from the movement’s website. 53 Details of the plan are taken from an article that Member of Knesset Anat Berko provided me and from an article by the journalist Ben Caspit on the Al-Monitor website: “The Plan to Divide Jerusalem That Challenges the Likud,” October 2, 2017. 54 For more on these dangers, see Shragai, Jerusalem: Delusions of Division. 56 For more on Jews’ economic dependence on Arabs and vice versa, see Marik Shtern, Occupational Integration in an Explosive Reality: East Jerusalem Residents in the Municipal Labor Market, Jerusalem Institute for Policy Research, 2015. 57 For more on the jurists’ report on this issue, see Shragai, Jerusalem: Delusions of Division, pp. 162-165. 59 Shragai, Jerusalem: Delusions of Division, pp. 56, 74. 61 For details, see ibid. 62 Moshe Arens, “A Disgrace for All Israelis,” Haaretz, December 12, 2016. The quotation is from the English version: Moshe Arens, “Shoafat: A Mark of Shame on All Israelis,” Haaretz, December 13, 2016.